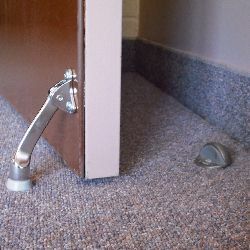 A door stop can be attached to the door, the floor or the wall. Whatever the method, the purpose for installing a doorstop is the same. We want to prevent the door from opening too far and damaging nearby walls. Wall mounted stops are either the spring type which are fastened to the baseboard or the hard rubber tipped door stop. The spring type door stop is very popular because they are not very visible. The rubber tipped stops are usually installed at the same height as the door knob. 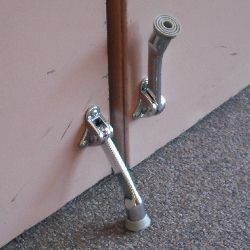 The most common floor mounted door stop looks a lot like the rubber tipped wall mounted stop except it has a straight edge where it will make contact with the door. This stop is fastened to the floor with one screw. Before tightening the screw push the door against the stop till they touch evenly, than secure the screw all the way. This door stop is not designed to prevent the door from opening too far. The purpose of this type of a door stop is to keep the door in an open position. The hinged swivel part is rubber capped and when swung down it will prevent the door from moving either way. When the door is to be closed, the stop is released by pushing the door slightly more open which releases the stop and allows it to be flipped upwards. There are all kinds of wedge shaped door stops available at your local hardware store. A wooden wedge can be easily made with just some basic tools. To hold the door in any open position just place the wedge underneath the door and pull the door slightly towards you. To release the wedge just push the door away a bit. Although widely used I would not recommend this type of door stop. If too much force is used opening the door the screws of the top hinge (to which the stop it is attached) may strip. If this happens the door will no longer close properly. To repair the hinge, longer screws will be needed or the screw holes have to be filled with wood before reinstalling the original screws. If the door is not installed perfect plumb the door will move in or out by itself. This can be a nuisance. If the door needs to stay open for long periods of time simply place a heavy object in front of it. Short from using the couch you can use just about whatever else comes in handy. Retailers also sell a wide variety of door stops that do the same thing. Just slide the stop underneath the door.